September whizzed by in a flurry of food and meet ups. I got by, with a vitamin B12 deficiency and a bout of laringyitis. All the more reason to eat you say? Thank you very much! I tried steamed buns for the first time and am absolutely hooked. Pork belly too. So much so, I'm looking forward to taking some more sweet buns this week. Last weekend, Persephone, Flick and I ventured over to Lewisham's Model Market. There we saw our favourite Mother Flipper but also these guys, Yum Bun. 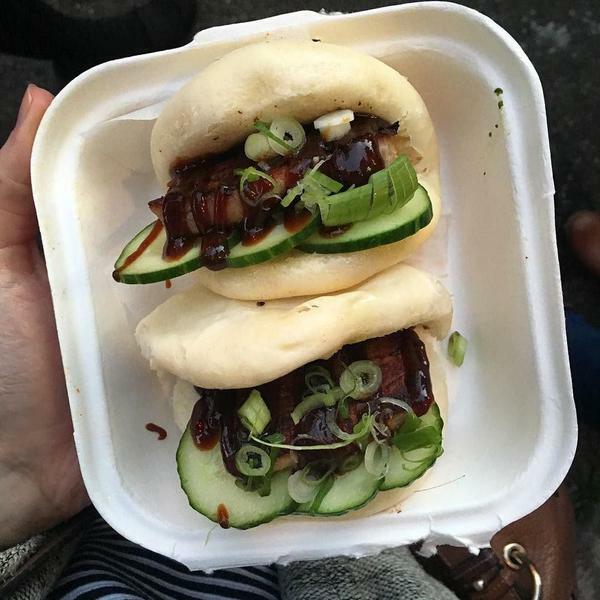 Soft plump steamed buns, tender pork and crisp cucumber with lashings of hoisin sauce. Awesome. I'm feeling seasonal. It didn't take much, but I'm already excited to get baking with sweet potato, cinnamon and apples. 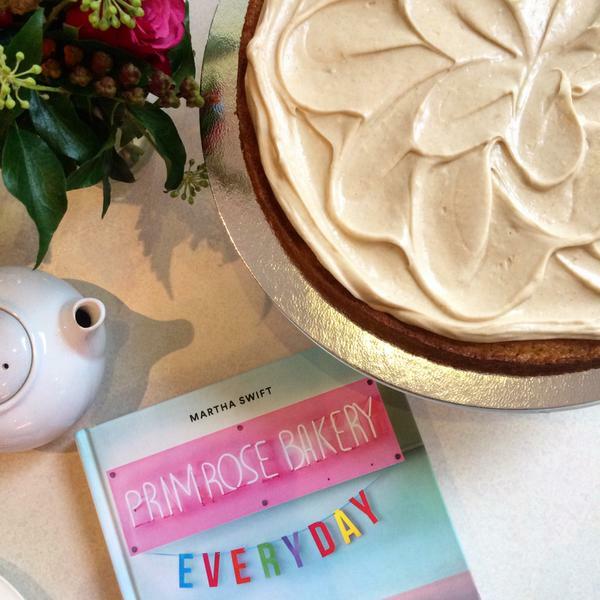 Zomato hosted a little get together with Primrose Bakery to celebrate National Cupcake Week and to show off their new book. This sweet potato cake with brown sugar frosting is glorious and I can't wait to recreate it. I had a sneaky little flick through the book and fell in love with pretty much all the recipes. If I were to have a book, this is exactly how I'd want it. So as you can imagine, I was thrilled to hear I'd won a copy when its released in the next few days! For months I've passed The Fire Station on the way to work and worried that their renovations would see it turn into a block of flats or hotel. When they finally reopened and revealed a new menu of burgers and stone baked pizzas, I grabbed Hannah and Flick and went to do research...! 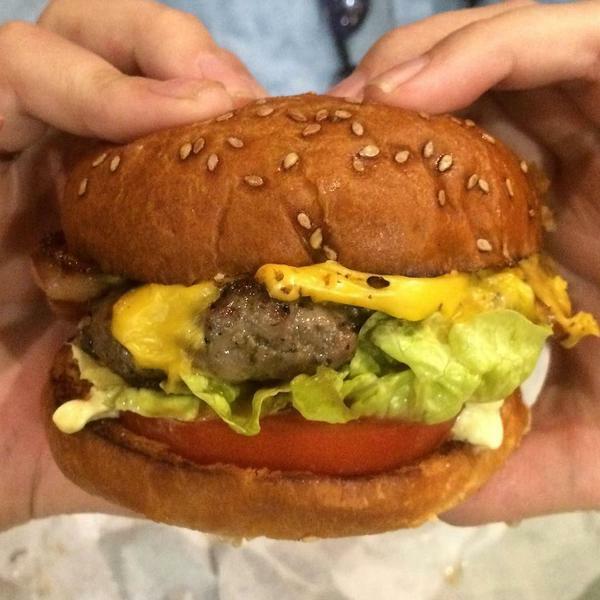 You need to know where's good for burgers within a 5 minute walk-radius of your office, right? The bun is gorgeously plump, the patties were tender and so much American cheese and maple bacon, I was in my element. They didn't scrimp on the fries either. Highly recommend this if you're near Waterloo. You may think I'm a little mad, but I booked train tickets up to Manchester just to try this place. Home Sweet Home have dominated my Twitter feed with their towering creations ever since I got Twitter. 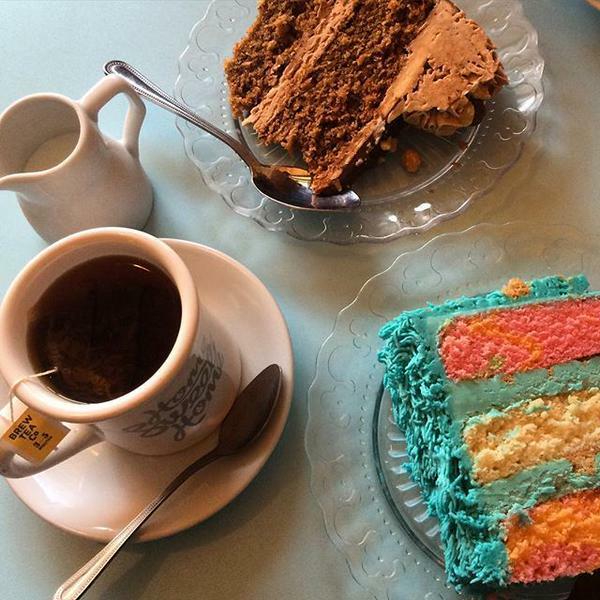 I went for the cookie monster which has a bright prink swirled sponge and cookies tucked in between each layer and Boy went for a hazelnutty chocolate creation. Far too sweet but great for a treat. We also stopped by Solita and absolutely loved their cheeseburger spring rolls. And lastly, if you've been round these parts for a while you'll know just how much I love yogurt. 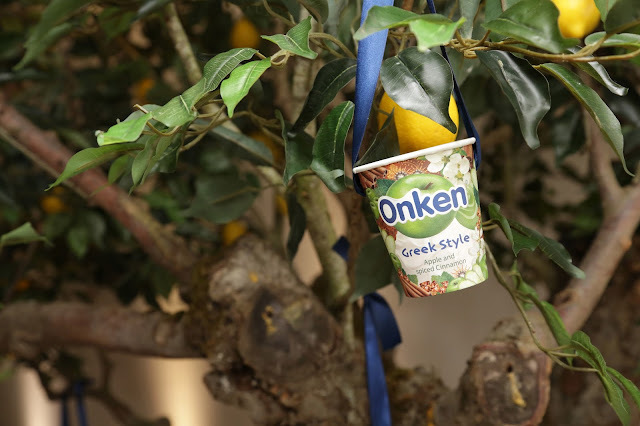 Onken hosted a great party to mark the launch of their new Greek range. This included Greek Gods, a Dairy Grove where yogurts hung from trees and plenty of cocktails. They even made yogurt portraits of the X Factor judges, pretty impressive. I loved all of the flavours, particularly apple and cinnamon one. Another monthly favourite of mine is Frankie's horroscopes, check out what's in store for you this October. Or just for a laugh, her clever infographic of what actually goes on in female toilets. If you're still in the need for a little more seasonality then Emily's pumpkin spiced latte macarons should do the trick! You were a steamed bun virgin? Noooooo! Thank god you rectified that. I second what that dastardly astute Mayfairy said... a life without steamed buns is not a life worth living! And Yum Bun are definitely London fave! Just looked at Home Sweet Home and Solita's menus (and food pics). No one could blame you for taking a train up to Manchester just for the food. Cheeseburger spring rolls sound like the best thing I've never eaten.